CMW 2019 Allan Waters Young Broadcaster of the Year Award Has Been Announced! Again, we had a record number of nominations and a tough job of determining a winner. With the breadth of young outstanding talent under the age of 30 in Canada, it becomes even more difficult each year. This year’s Allan Waters Young Broadcaster of the Year Award, in memory of legendary Radio Programmer Steve Young, has been chosen and this year the honouree, for the third year in a row, comes from the west. Brad Carp, is the chosen recipient. Brad is an amazing talent, who on his watch has became an important part of the fabric of Fort Mac, Alberta. 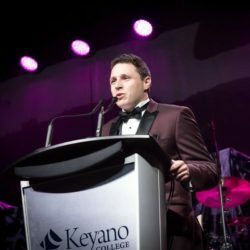 At the age of 28 Brad’s already been named one of Fort McMurray’s Top 50 Under 50, he was awarded the 2018 Western Association of Broadcasters ‘Leader Of Tomorrow’ distinction, plus he was the ‘Ted Rogers Award Winner’ for his efforts during the Fort McMurray wildfires. He volunteers for the Toy & Cash drive (Miracle Marathon), Santa’s Anonymous, the Wood Buffalo Food Bank Corporate Challenge & Food Drive, the Fort McMurray SPCA and raised $10K in support of KidSport. Brad was the first person called after the Humboldt Broncos tragedy when a voice was needed to call a Broncos/Grande Prairie Storm game in Peace River. For this he was recognized by Rogers’ President & CEO Joe Natale! Brad will be invited to participate in the Radio Interactive International activities at Canadian Music Week. He will be recognized during the Industry Award dinner on May 9thand presented his award at the Programming 2020 Masterclass panel earlier that day. Again, with so much talent submitted, it was also very difficult to narrow down to the runners up this year. Runners up were Rachel Ettinger of Virgin Radio/London, and Lauren Hunter of SONiC 102.9/Edmonton (second year in a row for Lauren). Congrats to Rachel and Lauren, Brad, and all the strong young talented ones under 30 who were nominated for the 11th annual Allan Waters Young Broadcaster of the Year Award, in memory of the legendary Radio Programmer Steve Young. For any additional info, please contact co-chairs Jim JJ Johnston at [email protected] or Bob Saint at [email protected].